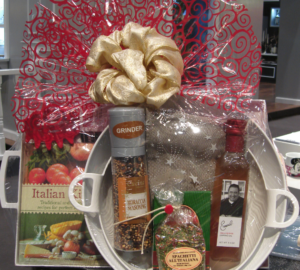 Do you know how to make a gift basket, one that turns heads and makes everyone ooh and aah when they see it? You can create beautiful designs just like professionals make. This article guides you from beginning to end and includes design ideas, too. I don’t remember a time when I didn’t use my hands to create beautiful things. My mom me enrolled in a sewing class when I was 10 years old. She sent me to summer camp where crafts were the main focus of daily projects. If any of this reminds you of your childhood experiences, your future with gift baskets will be as successful as mine is today. Ready to have fun? It’s time to begin. Let’s start with the basic equipment and supplies. 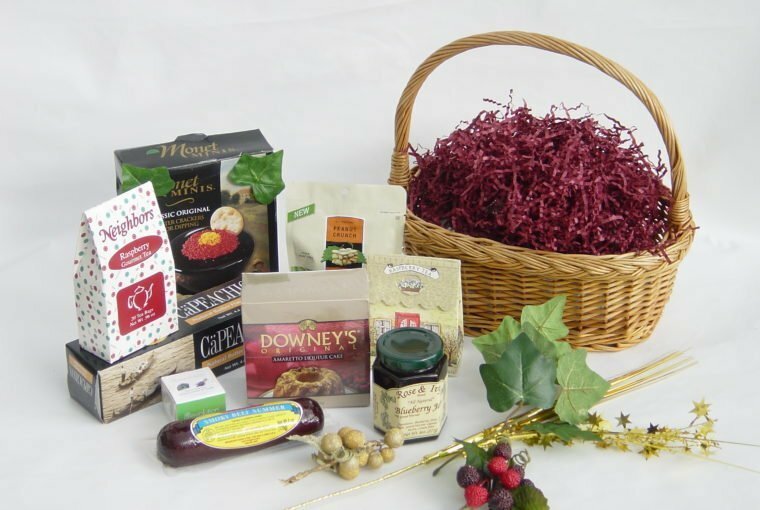 Here’s a list of items you need to make your first gift basket. Some of it will already be in your home. The rest are easy to find and buy. Basket – one that’s small or medium in size with an attached handle is a great option. Any color and shape is fine. Paper – this item goes inside of the basket to elevate the contents (foods and/or gifts). Paper with the firmness of supermarket bags is a good choice. Shred – Whether zig zag or crinkled in appearance, two handfuls of shred is enough. You’ll find shred at a local craft store. As with your basket choice, any color is appropriate. Foods – a collection of five to seven items, such as items listed in this article, is a great start. Your choice includes snacks such as crackers, chips, cookies, nuts, and a beverage of your choice (tea, coffee, etc.). Gifts (optional) – if making a non-food basket is your preference, focus on a collection of candles, soaps, picture frame, book, or kitchen items. Think about the reason you want to make this design, and then select products that model the occasion. Faux greenery or flowers – Better known as enhancements, these filler items visually bring life to your design. You’ll find floral in your home or at any craft store. Cellophane – This clear wrapping material is added around the completed design. Cellophane that’s at least 30 inches wide is adequate to enclose what you make. Bow – A bow, made with ribbon in the color of your choice, is placed around the cellophane. Its addition at the top of the complete gift basket secures the contents, finalizing your creation. Bows are found at party supply stores. Tape – Clear tape (not opaque) is easy to find at discount and office supply stores. It closes cellophane as it goes around the basket design. Twist tie – This long, thin item resembles a pipe cleaner, holding the cellophane in place before attaching the bow. Scissors – Snips and trims are needed on the enhancements, cellophane, and tape. Be sure to choose a sharp pair. Color photographs showing all of these items are shown in The Gift Basket Design Book. Your first gift basket won’t cost much money. The price depends on what you have on hand. Once you see what you have available, you’ll know what you need to buy. Are you excited? Let’s start designing. It warms my heart every time. 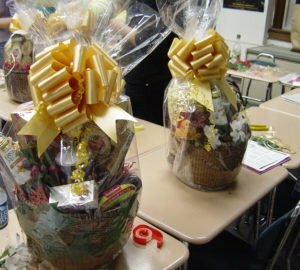 A one hour gift basket-making video is a bonus given to students in the Start Your Own Gift Basket Business online course. Here’s the 10-step instruction for you to follow. 1. Set the basket in front of you on a flat surface. The handle can be either side to side or front to back. Most designers choose side to side, but the final decision is yours. 2. Crush the paper in your palms and place it inside the basket. Add enough paper to fill the basket, leaving one inch of empty space around the very top near the rim. Be sure to make the filling dense so the foods and/or gifts are stable on top of the paper. 3. Put the foods and/or gifts (contents) on top of the paper within the basket. Taller items are in the back while shorter products are in front. These contents might fall or shift at the beginning, but the next steps will stabilize the design. 4. Shred is added atop the paper in between and around the contents. You want the paper to be hidden by the shred while the contents sit atop it. 5. Add enhancements wherever it looks attractive between and around the contents. Short enhancements look especially good in the front and on the sides. The design is nearly complete once these five steps are done. 6. It’s time to wrap your design in cellophane. Move the basket temporarily off the table, and lay the cellophane flat on the table. The open edge is in front, and the roll is to the back. 7. Bring the basket back onto the table and atop the cellophane. Bring the cellophane up and above the front and back of the basket adding an extra 6-8 inches above the handle. The cellophane’s sides are open and temporarily resemble a U-shape. Cut the cellophane from the roll, and place the remaining cellophane roll out of the way. 8. Gather the cellophane above the design (directly above the handle), and hold it tightly with one palm. Pull the cellophane up through your palm towards the ceiling. This tightening process is necessary for a smooth appearance around the design. Once done, attach a twist tie around the cellophane just below your palm as you remove your hand. This keeps the cellophane in place until you add the bow. 9. Close the U-shaped sides of the cellophane by bring the bottom part up and parallel to the basket, then folding the back opening to the front and front opening to the back. Place two inches of tape on the cellophane’s final back fold to keep the envelope-type closure secure. Repeat this method on the opposite side. 10. Tie the bow around the top of the cellophane where the twist tie is placed, You can now remove the twist tie. Take a look at your masterpiece Your design is complete! There are endless possibilities for gift basket making. What types of gift baskets will you create? Here are 10 ideas. Each of them are made with different products but in the same design format. No gift basket will looks alike because each one has your personal touch, a variety of colors, and the type of container (basket, box, chair, sleigh, etc.) you select. Now that you know how to make gift baskets, the process will be just as easy for you as it is for my in-person students. Which design type will you choose to begin creating beautiful gifts for family, friends, and others on your gift list? If you already make gift baskets, what part of design do you style differently than the method shared here?